A green salad seems so easy, so boring, but it’s one of those essential dishes like pasta, scrambled eggs, or a pot of beans, where the magic is in the details. I make one with pretty much every dinner I serve, and it ranks high in my list of favorite foods—salad with dinner is how I grew up, though I’ve come a ways from the Thousand Island dressing-ed and bagged Caesar salad-ed days of my youth. Nothing is quite as reliably refreshing. A pile of perfectly dressed greens, speckled with few or many adornments, and glistening with some bright zing and rich fruitiness in the form of a vinaigrette, is just what I want to round out a meal. Good lettuce is a no-brainer. 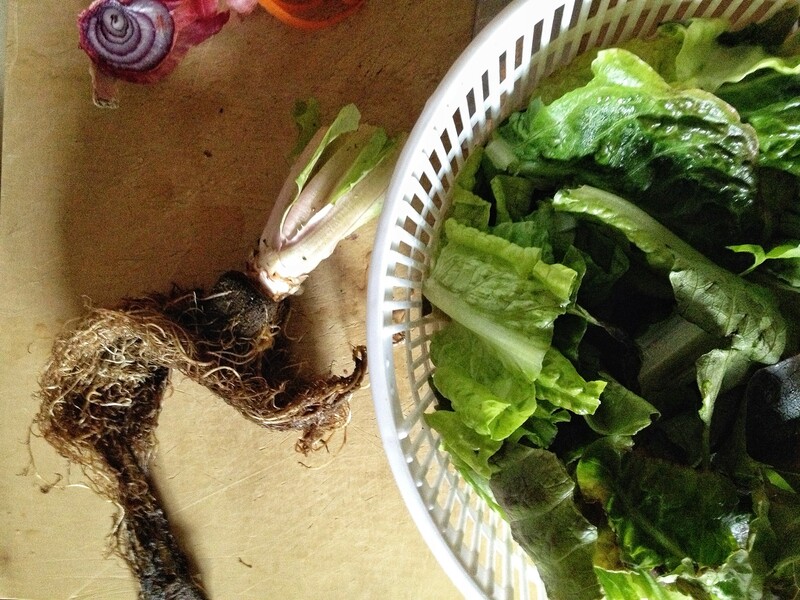 Save rubbery or wilted lettuce for . . . well, you might sauté it if it’s a hearty green like spinach or arugula or throw it into a smoothie, but for the most part you’ll probably just want to compost it. Some lettuces, if it looks like there’s some life left in them, can be revitalized by soaking them in ice water for 10 to 15 minutes. There are lots of good-quality pre-washed organic baby lettuces and lettuce blends out there, and I’m certainly not embarrassed to buy them. But lately, I’ve been most often drawn to the heads of green- and red-leaf lettuce sold still attached to its roots, from one of the stands at the farmer’s market near my apartment. It’s incredible how long these lettuces last—the one pictured, I bought it over a week and a half ago. I just pluck off leaves as I need them. 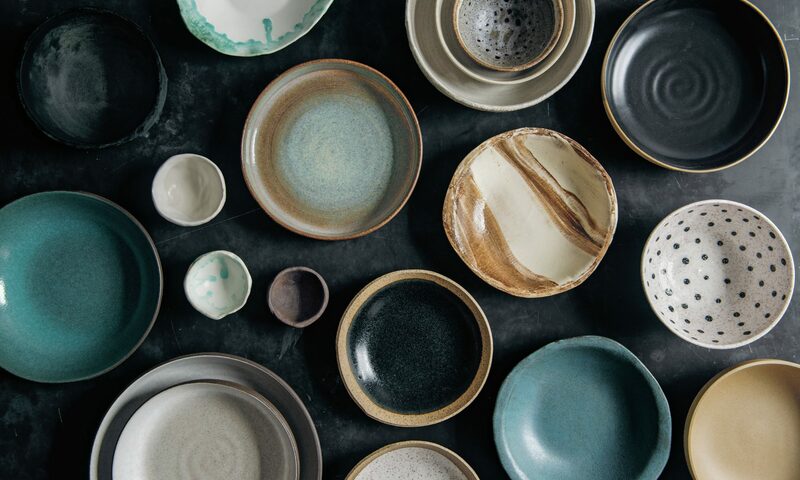 From there, the rest of the work falls into place with the help of some good olive oil and acid in the form of lemon or vinegar, and a few adornments based on whatever’s on hand. Lately I like adding pickled red onions to my salads, but often don’t have the time (or the foresight) to make a proper batch. So I’ve come up with this quick method, outlined below, to which I sometimes add other vegetables like carrots or baby turnips, that benefit from a bit of softening. Then the vinegar acts as the beginning of the dressing. “Meatier” vegetables like some roasted beets, cauliflower, or broccoli are nice to add, too; I chop or slice them thinly and add them to the greens gingerly, else they weigh the whole thing down. And for a main-dish salad, I always need some protein. Most often this comes in the form of a shower of nuts or seeds and/or a quartered hard-boiled egg, as below. Good cheese—like a few crumbles of blue or goat cheese, or some finely grated hard cheese like pecorino or parmesan or aged gouda—should be added with a light hand. Too much cheese will leaded up the whole thing. Green salads should always be assembled just before you eat them. You can usually prepare the components ahead of time, but once assembled and dressed, the clock is ticking. Use your favorite vinaigrette, and I have many favorite recipes for those. Or if you’ve got an olive oil that you really like, showcase that. Drizzle it right on top, dust the whole thing with fresh cracked pepper, and toss it with your hands. Be sure to taste a piece to see how it jibes with the vinegar, and adjust the balance as needed. (If you’ not soaking vegetables in vinegar beforehand as specified in the recipe below, sprinkle the vinegar over the salad at the same time as the olive oil.) And from there don’t waste any time getting to the table. I hope it’s a given that this salad is immensely versatile—the recipe below is really just a blueprint. Make omissions and substitutions as you please, and double, triple, or quadruple to fit your meal plans. Place the onion rings and carrot slices in your serving bowl. Sprinkle with the salt and sugar, then sprinkle with the vinegar. Stir so that the vegetables are well coated in the vinegar, then let stand, stirring occasionally, for at least 15 minutes. Meanwhile, hard-boil the egg: Place it in a small saucepan, cover with cold water, then place the pan over a high flame. When the water comes to a boil, remove it from the heat, cover with a lid, and let stand for 10 minutes. Immediately drain off the hot water and shock the egg in a bowl of ice water to cool for about 5 minutes. 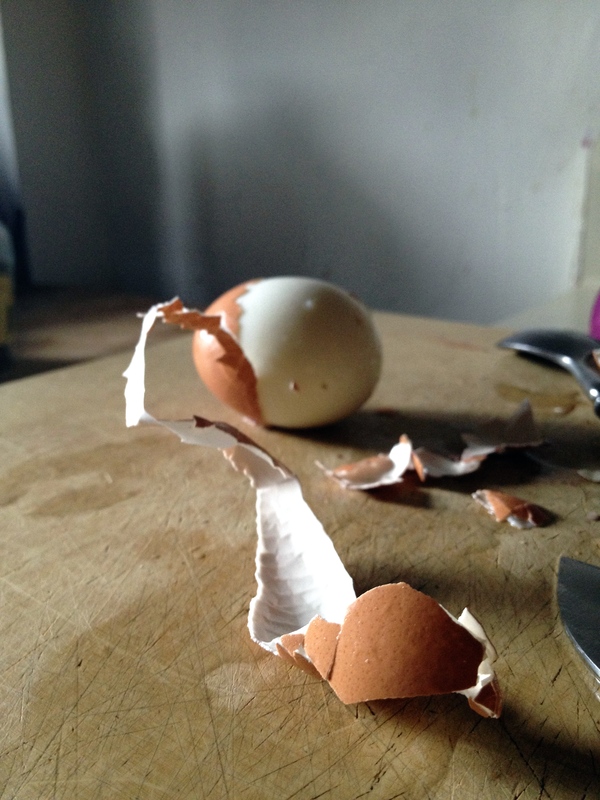 Peel and quarter the egg. Also meanwhile, toast the sesame seeds in a skillet over medium heat for 4 to 5 minutes, swirling frequently, until they’re aromatic and darken a shade. 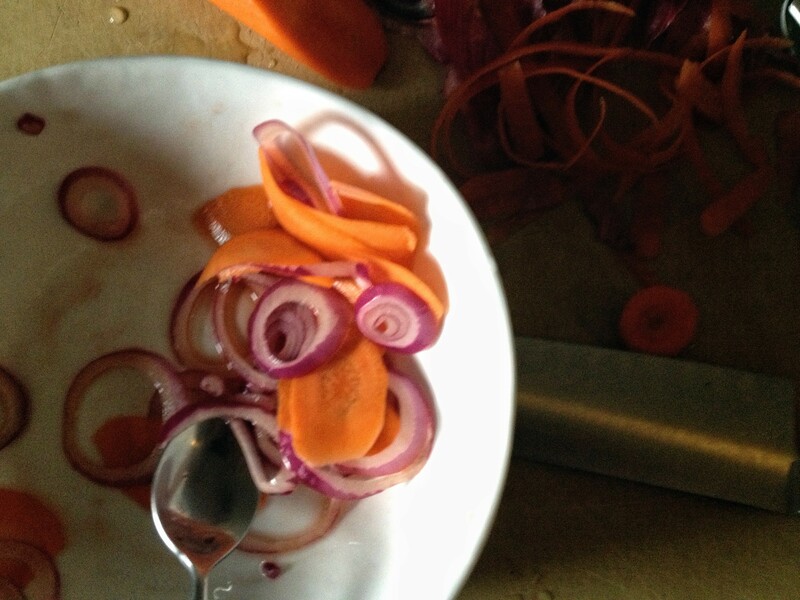 To assemble the salad, place the greens over the carrots and onions—don’t drain off the vinegar. Top with the beet slices, sunflower seeds, and about a tablespoon of olive oil. Toss gently with your hands, ensuring that each leaf is coated in the dressing. Taste a leaf, and add more vinegar or olive oil as you see fit. 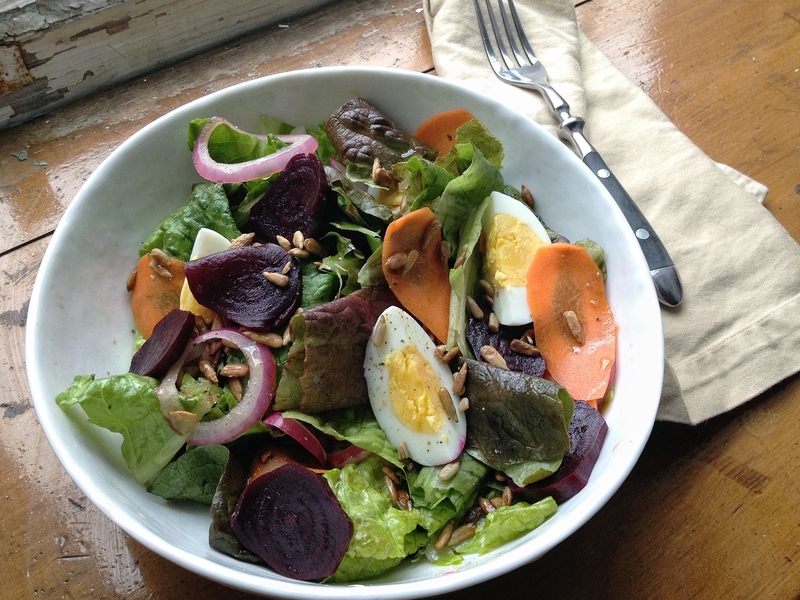 Arrange the egg over the top of the salad and serve.